When asked if I would like a copy of this book for review purposes I (as always) gladly accepted. I heard the title, and was intrigued. There are a ton of titles to choose from that offer ideas about how to make money and I figured why not give this one a shot? Before receiving this book, I had heard of Loral Langemeier, but did not really know much about her. So I decided that before reading, I would like to know a bit about the author. Basically, Loral (often known as “the millionaire maker”) offers programs and seminars that help build and expand businesses to make more money. As always, her methods come with mixed results. But if Put More Cash in Your Pocket is any indication, Loral’s advice and ideas may be worth the price tag of her other endeavors. I feel that it is necessary to explain what this book is not before I go into detail about what it is so if you are disinterested, I can spare you the reading. You’re welcome. 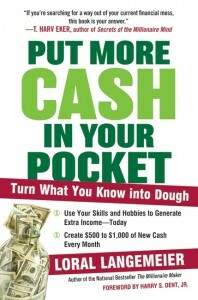 The subtitle: “turn what you know into dough” rings very true. But Put More Cash in Your Pocket does not focus on the “little things” that many would suggest to make some extra cash. That means you will not sit down to read this and be confused by or annoyed with suggestions of surveys, selling items that you do not need, selling garage sale items, freelance writing, or any other ways to pick up a few bucks. It is very clear from the beginning, that Ms. Langemeier’s intention is to teach you, step by step, how to put an extra $500-$1000 in your pocket every month. I found it a bit farfetched at first, but as I read, it became more and more apparent that this is very possible. But it does not come easy. How is this even possible? You start a business. Take what skills or talents you already have, and turn them into a business that you can promote and carry out with little to no startup costs. Loral even offers plenty of ideas herself that you can probably turn into a profitable business quickly and easily. My favorite aspect of Put More Cash in Your Pocket is that the author really does take you through the entire process from beginning to end. Since the goal here is not to create a fortune 500 company, but to get you some quick cash, everything is put in a very simplistic form. You will not have to burden yourself with a long-winded business plan or look for investors. All of the inception steps that “larger” businesses require are either simplified or removed completely with this plan. The goal is to get money quickly, after all. Another huge plus to Put More Cash in Your Pocket are the case studies. From the very beginning, the experiences of four volunteers that worked directly with Loral are shared. For those who actually try this and feel doomed to fail, the case studies may be the psychological “push” that proves to be the difference between success and failure. I believe that the intentions of sharing the case studies are two-fold. 1) To show that this can easily be done. 2) To excite and motivate readers to succeed with this “program”. Look, this book is a good read. There are plenty of ideas that can and will make you money. But keep in mind before reading that it is not intended for those who want to get some cash and get out. This is starting your own business, so if you are someone who can stay on top of and build something from the ground up, this book is for you. If you are looking for a quick, “in and out”, don’t bother. This project will require staying power and drive. If you have these two tools, the author provides the rest. Next post: 11 Invaluable Templates and Calculators For Free!